As I write this, the team is on the train from Ishinomaki to Sendai where we will catch the Shinkansen (bullet train) to Tokyo. We are stopped on the train tracks with alarm bells signaling some type of delay. Train travel in Japan is nearly always perfectly on time, yet it is our God who controls all things. He is aware of the reason for delay and has accounted for it in His plan. This trip has been step by step an opportunity for trust. Despite the 16-hour time difference, often when the team has needed prayer we have been able to communicate with our church back home. Thank you for praying for us as our journey has encountered difficulties big and small along the way. After traveling on a train from Ishinomaki to Sendai, a Shinkansen to Tokyo and a connecting train, we arrived in the Team center near Mitaka station in Tokyo. We met with Pastor Kaz to plan our first day of ministry here in Tokyo the same Christian preschool we visited last year. Our final ministry day in Ishinomaki was spent cleaning the café and passing out fliers at the local schools advertising J’s café English school. While waiting to pass out fliers, Luke and Nathaniel were approached by an adorable young girl that simply wanted to play. She picked flowers for Luke and pulled Nathaniel by the hand leading him to a soccer ball all the while as her grandparents looked on with smiles. Love passes language barriers and so far, the encounter with the little girl has been the highlight of the trip for my son, Nathaniel. After finishing ministry and purchasing needed supplies for the café, we decided to cook a meal together. It was encouraging to see everyone pitch in cooking together, chopping vegetables, doing dishes in shifts, and preparing food in tiny spaces. The body of Christ shares a bond that is like no other. Watching Kelen fellowship in Spanish with Jesse (originally from Peru) and Edgar (J’s café’s missionary from Mexico) was a faith building experience. God had engineered a team to work together who had previously not known one another and the outside observer would never know. Rich had shared in one of our debriefing sessions that having short term teams visit reminded him of a time in which he was hiking up hill with a heavy backpack. Someone placed their hand on his backpack and that slight forward pressure greatly lightened his load. It is not the size of the job before us, it is the heart in which we serve. We are called to come alongside the long-term missionaries, lighten their load, encourage, pray, and hopefully plant seeds with those they minister to that affirms their God given calling to the people of Japan. I ask that you join in prayer for Rich, Emi, Cherry, and Edgar and for J’s café that it would be a light in a place which does not easily receive the gospel message. May the Lord bring children to the English school and new families to the church services and may those who currently attend grow in the grace and the knowledge of our Lord Jesus Christ. Today the team visited a local nursing home and sang songs in Japanese, English, and Spanish. It was such a special time of loving on the residents and feeling overwhelmed by their hospitality. They sat us down at a traditional Japanese table and served us the most delicious homemade squash curry with rice and vegetables. Truly an answer to what seemed like an insignificant prayer—we happened to be craving curry! For dessert, we enjoyed a warm pancake filled with sweet red bean paste—also a favorite! After the meal, we sang “Happy Birthday” to celebrate the 92nd birthday of one of the ladies who lives in the home. We were surprised to discover that the Japanese sing “Happy Birthday” in English as opposed to a translated version of the song. Who knew?! Hannah, Cherry and Rich then led us in a few lovely songs of worship in English/Japanese and Edgar and I sang “La Bamba.” It was so fun to see everyone swaying, dancing and clapping their hands to the music. Teruko even joined us and sang a traditional “enka” karaoke song—she is quite the performer! Despite the language barrier, we felt warmly welcomed; sometimes a simple smile, handshake, hug or attempt to speak Japanese is all that is needed to convey the love of Jesus. Although the cherry blossoms have disappeared in Tokyo, we were blessed to be in Ishinomaki where they are in near full bloom despite the cool, wet weather. Later in the afternoon, once the sun brought light to the rainy sky, the team drove us up to Matsushima where we were able to experience a panoramic view of the surrounding area from Le Roman, a minimalist, nearly all glass café. Enjoying Darjeeling tea, coffee and baked treats beholding this view made for a yummy mid-day snack. Taking pictures there was such a highlight! As I write this my mind wander back to that moment, taking it all in as we knew we had to soon leave such a beautiful place and even more beautiful people who had become family. Worship and church service at the café is an intimate affair that reminds me of a family gathering. In addition to our team from CC Perris valley, Kelen, Cherry, Rich, Emi, Edgar, and Cade, we met Christian English teachers Mona Lisa, Terrie, Clayton, and Joseph, in addition to Japanese church members. After worship and a message from Rich we all shared cake, tea, and coffee. Japan Mission 2018 - Meet the Tanakas! 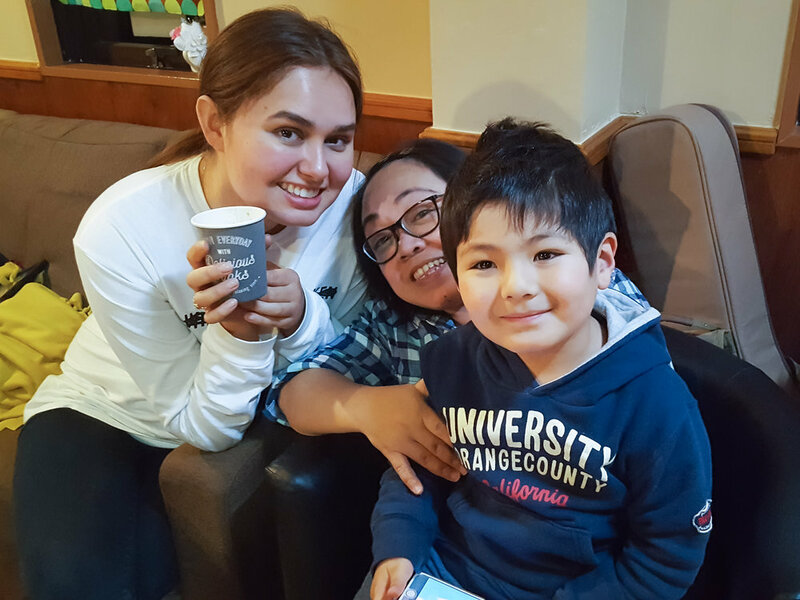 Meet the Tanaka family: Tom, Dianne, Nathaniel (17) and Natalie (13). We have been attending and serving in Calvary Chapel churches for the last 20 years and Calvary Chapel Perris Valley for about a year and a half. Tom works in the medical field and Dianne has been homeschooling for 12 years. Tom and Dianne have served in a divorced & separated group support ministry, in children’s ministry with preschoolers, missions support, and in prayer groups. Tom has always had a heart for missions. We originally found Calvary Chapel Perris Valley on the internet and were specifically interested in their focus on missions. Tom has had opportunities to participate in medical missions and short term mission trips to the Philippines and Mexico. More recently, Nathaniel participated in his first mission trip to San Vicente, Mexico and he thoroughly enjoyed the opportunity to serve along with his dad. 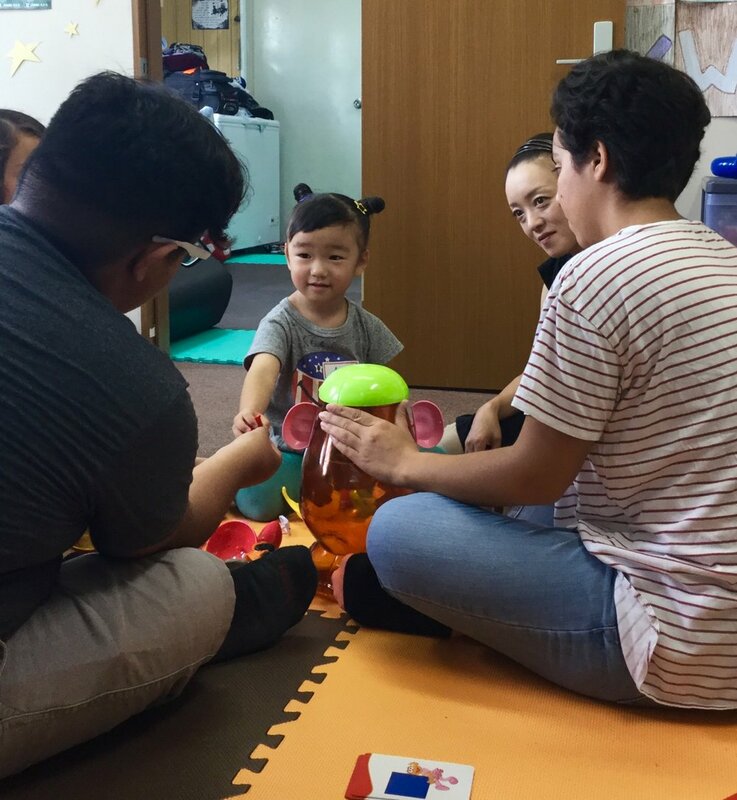 In Japan, Pastor Bob has assigned us to work along with the team in teaching English to the Japanese children. Dianne is very excited for this opportunity and especially for the opportunity to experience a mission trip with the entire family. We ask that you pray that we would be fully equipped by the Lord to minister His love to these children in His Spirit. Tom’s first language was Japanese but he has forgotten most of it over the years. Please pray that the Lord would bring to his remembrance the Japanese language that he might use it as needed for ministry. Nathaniel requests that you pray that we would touch the lives of the Japanese people we meet. This is Natalie’s first mission trip and first time traveling out of the country. Please pray for faith and courage to trust in the Lord throughout the trip. One of our favorite verses is “As for me and my house, we will serve the Lord” Joshua 24:15. We are thankful the Lord has opened this door for our family to serve together. It is such a joy to be writing this in J’s Café. Our morning was blessed by worship led by Hannah and a devotional in Ephesians 4 in which each participant was able to share. In addition to the team from CC Perris Valley, Edgar (a missionary who relocated from Mexico) and Cade (an American serviceman from the air force) joined us. After fellowship, the ladies stayed in the café and ministered to Japanese women helping them with their conversational English. 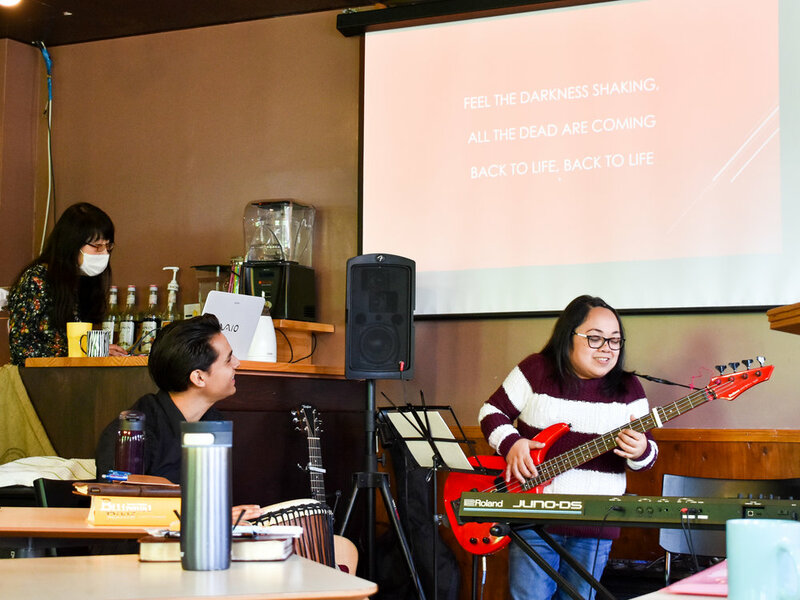 J’s café has fostered many long-term relationships with their neighbors, and it is evident that the light of the love of Jesus can be found here. Pictured is one of the ladies who fellowships at the café, Teruko, with the team. 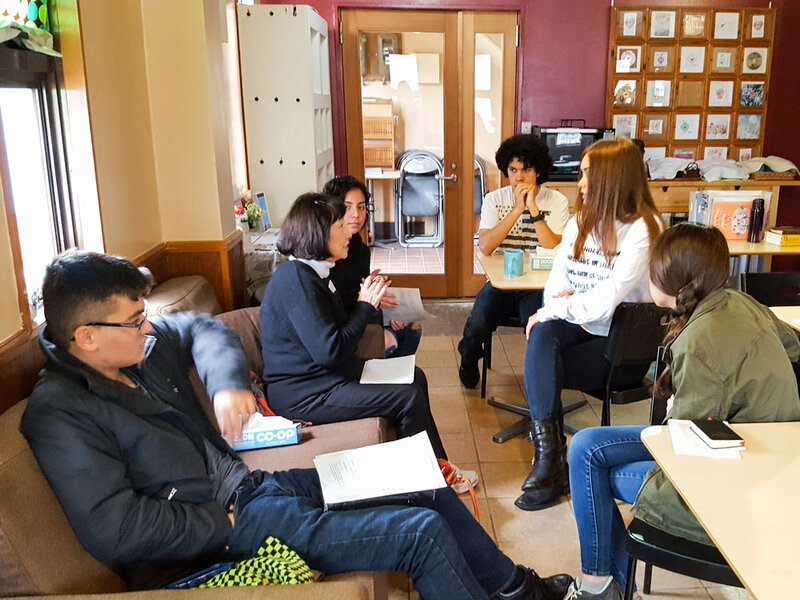 While the ladies ministered to Japanese women in the café, the men left to help Rich organize and clean a shed holding various needed materials. It is very true that many hands make light work and not only was Rich blessed, but the young men who helped were as well in the joy that comes from a job well done. It is not the size of the job, large or small, but the heart in it to glorify the Lord which makes it all worthwhile. Hannah’s account of Day 1: While preparing to come on this trip, I felt very secure in the fact that God’s hand would protect us and control the situations that could arise while in Japan. For anything that we desire to accomplish in the name of the Lord, Satan is quick to put many obstacles in our way, and this trip was no different. As soon as the trip towards LAX began I noticed that I continued to lose and forget the location of my phone. This was something very small that I knew I didn’t need on this trip, however, the fact that I kept losing my possessions put an unsettling feeling in me. Once we arrived in Japan we first took care of converting our money and purchasing all our necessities to travel from city to city. After purchasing what is known as a JR Pass (used to go on the bullet trains), I lost track of it after we exited our first train from Tokyo to Sendai. Knowing that this pass was not cheap and that we had a connecting train to Ishinomaki in less than an hour, I began to feel horrible for constantly disrupting the team’s plans and setting us back over an hour. Tom and I then decided to retrace our steps and ask the officers if any pass had been turned in, but nothing was found. 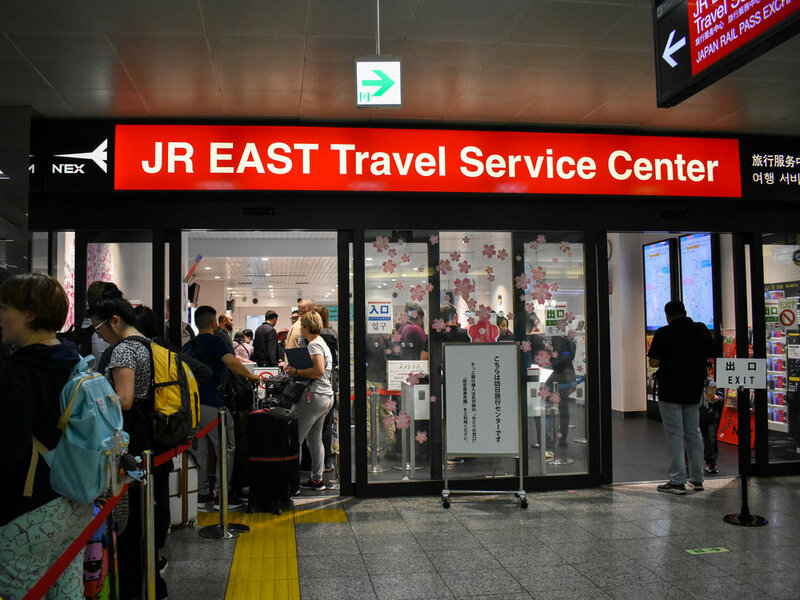 With less than 10 minutes to get a train ticket and find the train, we raced to the nearest JR East Ticket Office, purchased the ticket, and arrived right before the last train departed. The following day Rich called the train station, where I lost my pass, to follow up on whether it was found. The lady then began to say that one was found but needed to be verified if it was mine. After 15 minutes we got a call back verifying that it was mine! However, it was on the other side of Japan, roughly 3 hours by shinkansen (an expensive alternative) or 6 hours by driving. Later, we found that we could get it shipped to Ishinomaki for only a shipping fee and would arrive the day before we leave to go back to Tokyo. This was definitely a blessing and miracle from The Lord! All night we kept praying that the Lord would work a miracle and He did. I had so many opportunities to forget about finding my JR Pass and just buy another one the following morning. But it was at the expense of losing all my money for food, or possibly getting stuck in Tokyo by not having enough money for a ticket. However, The Lord was in control of everything. He gave me a team that was standing by me and supporting me through the trial and parents that were willing to provide emergency money, to ensure that I arrived safely to the place that the Lord desired for us to go. I could have fallen into the mentality of having gone onto a horrible mission trip that had nothing but disasters waiting for me, but the team and I stood strong knowing that this trip was God’s will, and nothing could stop us. “What, then, shall we say unto these things? If God is for us, who is against us?” (Romans 8:31). Part I: Taking small steps of faith leads to great blessings. Currently as I write this, 6 members of our team: Tom, myself (Dianne), Hannah, Luke, Nathaniel, and Natalie are all safely in our seats and eagerly awaiting our arrival in Japan. Our morning began with everyone meeting at our home. After a few minor hiccups, forgetting a passport and phone, which required slight detours, we were on our way. It is one thing traveling and being led by a seasoned international traveler such as Pastor Bob and another thing entirely learning to lead a team. As always, the Lord is the one who leads, and the Lord is the one who goes before us, behind us, and we simply walk in His steps. Despite my easygoing personality, I tend to be a person who likes everything in order and to be very early at airports. As we were driving to the airport waiting in line arriving an hour later than I had anticipated, I had the opportunity to exercise baby steps of faith. Instead of pondering what might go wrong as I waited in line, I pondered the disciples who were in the storm while Jesus slept. Knowing Jesus is always with me, why should I fear? It is an exercise in trust that is always sweetly rewarded. It is my heart to learn this lesson well. My prayer therefore, is not that we might not be faced with trials on this trip but instead that we might respond to them with faith, trust, and joy, knowing that the Lord always has a plan. Part 2: After writing this, the entire team had opportunities to continue to trust. Upon arrival in Japan, the pilot aborted the 1st landing attempt due to severe turbulence. Upon the 2nd successful attempt the entire plane cheered as we landed. Due to the late arrival, some communication difficulties, and a lost rail pass we found ourselves severely off schedule. We caught the last possible Shinkansen to Sendai and were warmly welcomed by Rich, Cherry, and Edgar. We definitely appreciated every prayer for the team! Japan Mission 2018 - Meet Luke Campos! Hi! 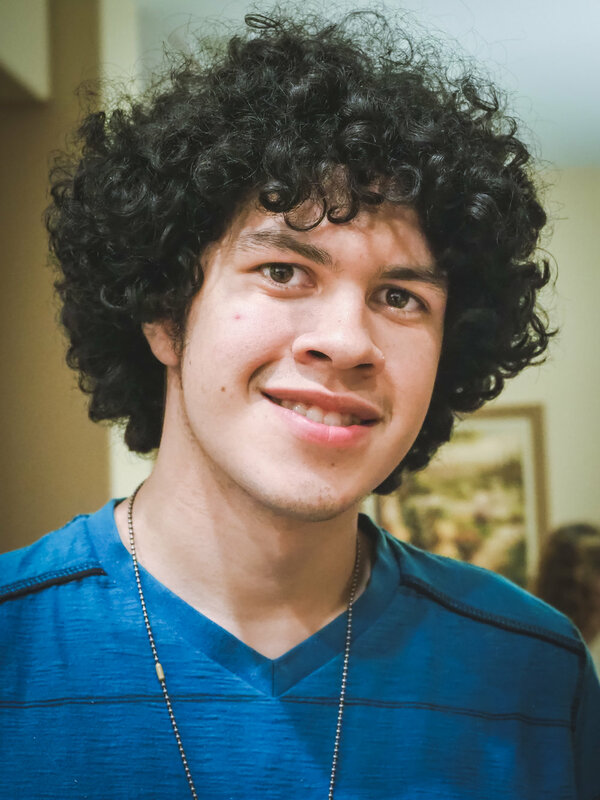 I’m Luke Campos, an 18-year-old senior in high school. I was born into California under a loving Christian family, nourished and well established in my faith throughout the years. Having lived my years in a homeschool environment, life was breezy and comfortable. Eventually, I fell into a dangerous state of complacency. God then decided to shake my life and change my school. While my initial reaction was furthering my backsliding tendencies, things changed when I attended a summer camp in high school. Here the councilors and youth leaders encouraged every student to find out what God was ministering to us in that very same camp. This event completely changed my perspective on Christianity, that God wanted a personal relationship with me and I had to pursue it. With this new outlook, I was unexpectedly invited to Japan with this church. I had never been on a mission’s trip prior to this, so this was an encouraging opportunity. Although not greatly acquainted with the culture, I was filled in by both the missions and my own sister (who has a small obsession with Asian culture). Shortly after, numerous people jumped to sponsor my trip nearly covering the price of the entire trip. If anything, I would pray for personal wisdom when dealing with the people of the country and boldness in the Lord. Simply preparing for this trip has greatly encouraged my faith, I am more than excited to learn more of the ways God works through his people. I believe in all things we should grow in our relationship with God, but, by all means, I hope to grow even further in my spiritual faith and an even deeper relation with the Lord. Japan Mission 2018 - Meet Kelen! Hi, I'm Kelen Caldwell and I'm thrilled to be joining the CCPV trip to Japan. I’m 21, graduated from Wheaton College, IL in May '17 and currently work as a management consultant based out of Atlanta, GA. My family was always hopping around because of my dad's job so I'm passionate about celebrating diversity within the body of Christ. I spent many summers with my extended family in the Ecuadorian Amazon, doing children's ministry and serving in any way we were needed. God put Japan on my heart through a vision that I had in early March and I felt an immediate calling and desire to go, despite knowing very little about the culture and how this could even be feasible. Yet, He provided and used a simple Google search to connect me to the generous and loving community at CCPV. I pray that God would use this trip to radically transform the lives of not only the people we are blessed to minister to, but also us. A recent theme for me in this season of life has been cultivating selflessness. In our fast-paced society, it is so easy to become caught up in what we need to do and focusing on ourselves instead of others. But we are anointed for so much more! I pray that the hearts of stone would be replaced with hearts of flesh on this trip, that we would be open and willing to let God move in and through us. When I told my family that I was praying about going to Japan, they had so much peace and have been incredibly supportive. I'm so thankful that God has opened this door and given me this opportunity-stoked to see how he moves! You may contact our Mission Administrator with any questions by calling (951) 943-5979, ext. 10 or by email. We do suggest you first download the Japan Mission Booklet as many answers are there. Also review past posts of our 2017 Mission trip to Japan Blog. Every been to Japan? Ever been to Japan in the spring when the cherry blossoms are blooming? If you were to travel to Japan on a vacation the cost could be well over $6000 for two people. But what if you could travel to Japan for ten (10) days at half the cost and at the same time be serving the Lord furthering the Gospel? Do we have your attention? Well it is possible and the dates to join us are April 5-15, 2018. The cost is estimated at $1500 per person and includes airfare and in-country travel and housing, s well as some sightseeing. True, you will not be experiencing a 5-star lifestyle but you will experience spiritual growth, faith building while having personal contact with the people of Japan working alongside Japanese Christians and missionaries. Where do you start? Sign-up HERE on our event page. Christin our Missions Administrator will then email you all the documentation and instructions on what to do next. But get started right away as there is limited space and there is a lot of interest. Also, you will want to download a Japan Mission Booklet that gives you a greater understanding of this mission. “And those who know your name put their trust in you, for you, O Lord, have not forsaken those who seek you" (Ps. 9:10). Coming on this mission trip takes, what feels like, a huge amount of faith and trust in the Lord. To know that some things may go wrong or not as planned but to be able to stop and say "It's okay, The Lords got this". As a team, I have found that no matter what has been thrown our way we have been willing to follow wherever The Lord and Pastor Bob takes us. I found that while doing missionary work we can often become so distracted with what we're doing or by our own exhaustion that we forget to have our own time with The Lord. We then lack the spiritual "food" that keeps us strengthened and protected during our ministry. It is up to us to keep each other and ourselves accountable to spend time with The Lord daily. Through these study's together and individually we are able to feel the presence of The Lord no matter where we are or what is going on. He guides us our steps and protects us as long as we stay faithful and seek after him. Being the youngest on the team, I went on this trip not really knowing if I would be able to minister to the people of Japan. I doubted my ability to speak to people and my knowledge of the Bible. But so far, during this trip, God has proved me wrong. I handed out flyers, and some people even came up to me to get one. I was at J's Cafe, and I got to teach English to a Japanese girl who was my age. I think God is showing me that you only need a willing heart to do His work, and He will take care of the rest. God is really the one who is doing the work through us, we are just His instrument. It doesn't matter what age you are, because God can use anyone who simply wants and is willing to do something for Him. Time in Ishinomaki has gone well. Having a team that is flexible is of great enjoyment and this is one of those teams. The week was not without some disappointments. Some team members were prepared to teach children English. Our missionaries handed out flyers and spoke to moms and expected a strong attendance. But this was not the case with only a few children attending. The team still put their heart into it and ministered to those children that came. Another point of adjustment was the day we were to visit the temporary housing for a BBQ. We had to move the day and this caused some time conflicts due to other ministry. I fear this maybe hindered our effectiveness. However, we trust the Lord that his Spirit will still use the time we had. The women’s event was well attended with Cosima teaching on God’s Grace using the song Amazing Grace. A wonderful discovery was that this song is well known throughout Japan and so those Japanese ladies that attended had a basic knowledge of the song. Cosima teaching on the meaning and purpose of Grace was well received. Several women missionaries brought Japanese women they have been ministering to the meeting making for a special experience. A couple of the young members on our team said they were expecting to do some manual labor type ministry. Well, they got their wish as there was patching needed on the cafe walls to prepare for painting. These walls were repaired by a team who came last year but had not yet been painted. There are always things you wish you had time to do or wish could have gone better but I am very pleased with this team and the ministry we accomplished. All but two members of our team has never been to Japan before. Most of the team has never been out of the country. Hannah Arenales came for the first time last year, so this is here second trip. My wife lived here in 1990-1991 when we served here and later came back over 10 years ago. Traveling can effect people in different ways especially when it is across the Pacific ocean. This team all did well. Returning from a mission trip can effect a person even more. Now having given of themselves to serve others in a foreign land there is a new perspective on the world. A perspective that is alien to most Christians unless they have taken a similar trip. Having taken over a hundred mission trips the response of my fellow Christians typically fall into two camps. Those who ask, "How was your trip,?" only to change the subject as soon as you say, "wonderful" or "it was awesome," There there are those you ask and follow with attentive eyes waiting to understand and maybe get a hint what it may be like for them. There is a third camp consisting of people that didn't realize you left though they were made aware you were leaving on a mission trip. This camp asks, "Weren't you going on a mission trip somewhere?" "Yep, that was a couple weeks ago," I'd respond. "Oh," is the usual embarrassed response. I once got that question after my family and I had been gone for a year in Japan. As our team returns which camp will you fall in? Will your question be small talk as if about the weather or will you be interested in the details of what God did in that team member? Which camp you are in can make all the difference on how the Lord is able to minister to you personally. You see, a part of the mission is sharing testimony of what the Lord has done. When Paul and Barnabas returned from their first mission they gave report with those in Antioch who sent them. So be ready to listen, learn and be uplifted by their testimony. Be ready to receive. Hello! I am Xavier and I was born in Long Beach and raised in Carson by my single mother and grandparents. I grew up with my mom having semi regular low blood sugars since I was five. My grandfather died when I was 11 and I lost my grandmother 10 months later. Shortly after my mother's health began to decline and she died a year later. I moved out to Perris with my Uncle Ruben and Aunt Velia Griego. I started volunteering in the Friday night teen groups and eventually helped as a teen leader in the 2016 Harvest Crusade. I signed up for the Japan mission trip the following year. Hi I'm Hunter Morris I am a 18 year old college student currently attending Cal Poly Pomona as a second year student. In my spare time I am an avid outdoorsmen, I enjoy hunting and fishing. I came to take Lord as my personal savior in March of 2016. I never anticipated doing a missions trip, but after a lot of praying I felt called to go. I have been challenged with some minor health problems prior to the trip. It's made me remember that Jesus is in control of all things and that it's just the devil doing his work prior to the trip. Though nervous about the trip I look forward to the experiences to be gained from this trip. I ask for prayer of good health and that the Lord's work be done while we are over here. A part of our mission that every team enjoys is the 2 hour ride on the Shinkansen (often called the Bullet Train) traveling from Tokyo or Ueno to Sendai to the north. This part of the trip comes by way of a 5-day pass that we use to travel on any JR train line, including the Shinkansen. It is an amazingly smooth ride in comfortable reclining seats. Its cheaper than flying and more enjoyable as the train speeds by open farm land between the few cities it stops at. Watch the video below for a taste of the ride. The video is not sped up. Ride on the Shinkansen for 60 seconds of the typical 2-hr trip it takes to ride from Ueno to Sendai.